The first railroad of the Culver-Palms area was the line now known as the Santa Monica Airline of the Pacific Electric Railway . Originally a steam railroad, its construction was started over 71 years ago in January, 1875, and the first train operated over the line between Santa Monica and Los Angeles in December, 1875. This railroad, the second one in Southern California, was known as the Los Angeles and Independence R.R. as its owner intended to extend it from tidewater at Santa Monica to serve mining interests in Independence (Owens Valley), and ultimately easterly to form a transcontinental railroad. John P. Jones , builder of this railroad, was also founder of the town of Santa Monica, former Sheriff of Trinity County, owner of rich mines in the Comstock Lode of Nevada and United States Senator from Nevada for 30 years. Jones built the 18 miles of track between Los Angeles and Santa Monica for a reported cost of $375,000, largely his own money, for he received no government subsidies or land grants as did the Southern Pacific Company. Some of the right of way was given by local ranchers who were anxious to have the railroad. Photo of Senator John P. Jones from Autobiographies and portraits of the President cabinet Supreme court and Fifty-fifth Congress (1899). The first "whistle stops" established along railroad were "Ivy Station" and "Bay View Station." Ivy Station was where the railroad crossed Ballona Road, now Washington Boulevard, and included the property now occupied by the railroad section headquarters. After the electric railway crossed the steam railroad at this point in 1902, it became Ivy Junction and some years later Culver Junction. That crude shelter remained until shortly after the founding of the community of Palms, when "The Palms" Depot was constructed. The exact time of erecting of the present building is unknown to the writer and is not in any published history but is probably buried somewhere in the archives of the railroad. When the Southern Pacific entered Los Angeles in 1876, it was part of a deal that publicly owned railroad to San Pedro be forfeited to the private company, along with considerable land and money. The railroad company realized that control of the Santa Monica road would give it complete monopoly, so in 1877 the Los Angeles and Independence R.R. became the property of the Southern Pacific. The Southern Pacific exploited its monopoly for many years until 1886 when the Santa Fe railway entered Los Angeles with real competition. The ensuing rate war brought passenger fares so ridiculously low that a great influx of people began and a land boom started. It was during this boom that the town of Palms was subdivided on December 24, 1886. The early growth of the committee was sufficient for the Southern Pacific to erect the handsome depot, substantially better than most Southern California towns boasted. 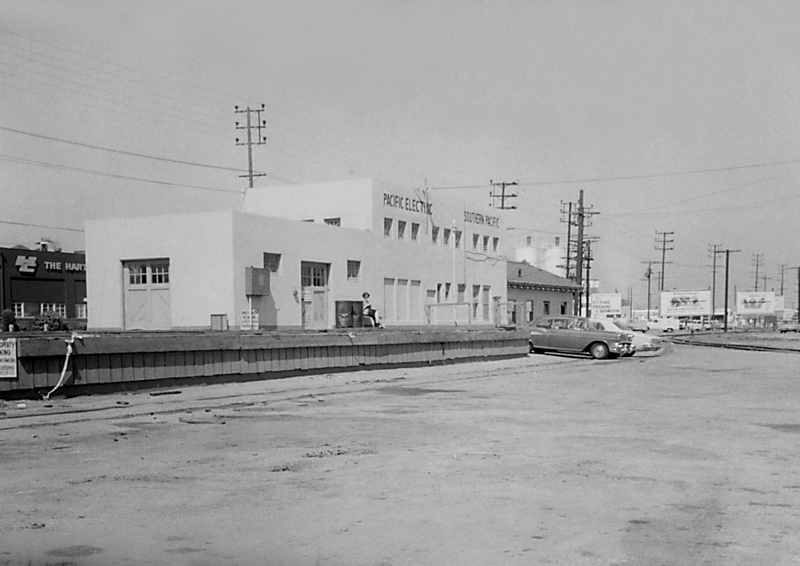 This building still stands as one of the oldest historic landmarks of Palms , though it is many years since it was used for railroad purposes, because of curtailment of passenger service on the Santa Monica Airline by its present operators, the Pacific Electric Railway , and because the Palms and Culver City freight offices were combined in one location. The old depot was used as a private residence for many years by J. W. Smith, retired station agent, who served the community for a long period. Today the station is used as the field office of A. Farnell Blair Co., contractors on the big new plant of the Great Western Biscuit Co., now under construction on part of the former railroad station lands which were deeded to the Los Angeles and Independence R.R. on May 18, 1887 by Mrs. Rita Botiller de Aguilar, widow of Macedonio Aguilar, who was the first purchaser of real estate which is now the heart of Palms and Culver City. The name Aguilar is prominent in early local records and even today that fabulously valuable property occupied by Metro, Goldwyn, Mayer Studios has a legal description "Part of Macedonio Aguilar 819 acre allotment in Rancho La Ballona." Motion pictures invaded this community 31 years ago, the first studio was that of the Kalem Company, which located in Palms in February, 1915. Thomas H. Ince bought land in September, 1915 and the New York Motion Picture Corp. built upon that land the plant which is now Metro Goldwyn Mayer. On many occasions the "movies" have used the old Palms depot for exterior shots where they wanted a typical old-time station building to suit the story. It was a convenient location to the studios and there were no fast, through trains to interfere with the shooting schedule. Usually the sign on the depot which read "The Palms" was covered with one which read “Hilldale” or whenever name the scenario called for. Joan Crawford and other famous stars have waited for the train to come in here. The writer recalls one occasion many years ago, when M.G.M. was using the station and a picture starring Jean Harlow. Between shots he climbed into the locomotive cab for a visit with the engineer and fireman. The party was then joined by Miss Harlow who wanted "to see what a steam engine looks like." She was thrilled by all the gadgets of the fiery monster and the train men seemed thrilled by the platinum blonde, at least they were speechless so the writer undertook to explain to the star how the engine worked.